, an English prelate, son of the preceding, received his education at Winchester school, and was thence elected fellow of New college, Oxford; where he took his degrees in arts, that of bachelor, April 14, 1659, and that of master in the beginning of 1663. 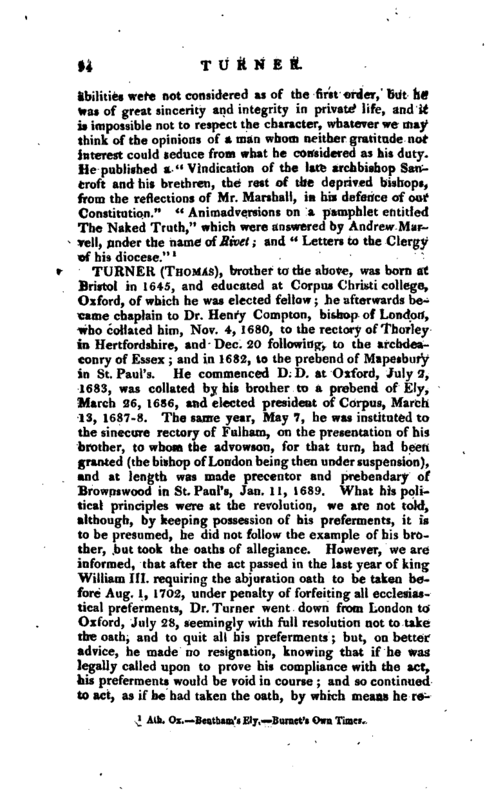 He commenced B. I), and D. D. July 6, 1669, and in December following was collated to the prebend of Sneating in St. Paul’s. 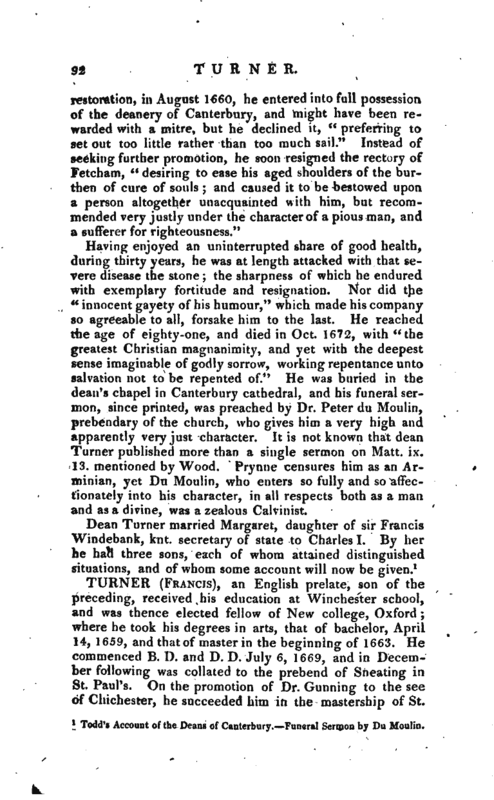 On the promotion of Dr. Gunning to the see of Chichester, he succeeded him in the mastership of St. | John’s college, Cambridge, April 11, 1670. In 1683, he was made dean of Windsor, and the same year, was promoted to the see of Rochester, being consecrated on Nov. 11, and next year Aug. 23, was translated to the bishopric of Ely. Though he owed most of these preferments to the influence of the duke of York, afterwards James II. yet on the accession of that prince to the throne, as soon as he perceived the violent measures that were pursued, and the open attempts to introduce popery and arbitrary power, he opposed them to the utmost. He was one of the six bishops who joined archbishop Sancroft on May 18, 1688, in subscribing and presenting a petition to the king, setting forth their reasons, why they could not comply with his commands, in causing his majesty’s “Declaration for liberty of conscience” to be read in their churches. 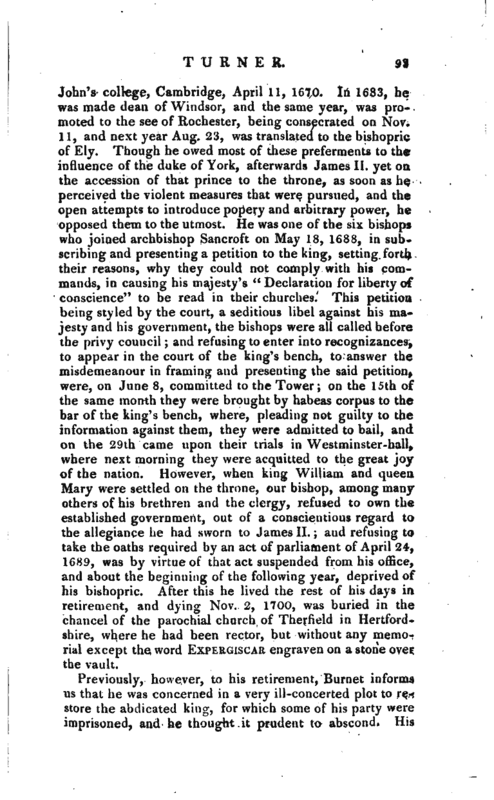 This petition being styled by the court, a seditious libel against his majesty and his government, the bishops were all called before the privy council; and refusing to enter into recognizances, to appear in the court of the king’s bench, to answer the misdemeanour in framing and presenting the said petition, were, on June 8, committed to the Tower; on the 15th of the same month they were brought by habeas corpus to the bar of the king’s bench, where, pleading not guilty to the information against them, they were admitted to bail, and on the 29th came upon their trials in Westminster-hall, where next morning they were acquitted to the great joy of the nation. However, when king William and queen Mary were settled on the throne, our bishop, among many others of his brethren and the clergy, refused to own the established government, out of a conscientious regard to the allegiance he had sworn to James II. ; and refusing to take the oaths required by an act of parliament of April 24, 1689, was by virtue of that act suspended from his office, and about the beginning of the following year, deprived of his bishopric. After this he lived the rest of his days in retirement, and dying Nov. 2, 1700, was buried in the chancel of the parochial church of Therfteld in Hertfordshire, where he had been rector, but without any memorial except the word Expergiscar engraven on a stone over the vault. Ath. Ox. -Bentham’s Ely. Burnet’s Own Times.